I mentioned yesterday that chef Simon Rimmer had returned to TV on the new Channel 4 magazine programme Sunday Brunch. As today's weather was surprising pleasant for this time of year, I decided to make one of the dishes that Simon had presented yesterday, Smoked Mackerel Salad. Preheat the oven to 180°C/fan 160°C/gas mark 4. For the salad, mix the lemon, mayonnaise and mustard together in a medium sized bowl. Then fold in the spuds, mint, onion and some salt and pepper. 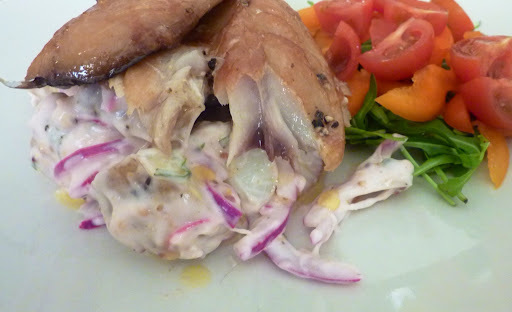 Lay each piece of mackerel in the middle of a piece of foil, top with some butter and lemon juice and wrap up. Place in a baking tray and bake for 6 minutes. Serve a ring of spuds with the fish on top, and some dressed salad leaves. Finally, pour over the hot lemon butter from the baking foil. The end result was a delicate balance of flavours that worked incredibly well as a light evening dinner on a warm evening, but it would also make great summer lunchtime snack. That's not bad, one episode of Sunday Brunch, one dish tried and tested, one new recipe that I'll cook again. Keep up the good work Simon.